Most full-size shop mills used by machinists are now available with a digital readout. They are popular because they make your life as a machinist much easier. Readouts on the X- Y- and Z-axes can be reset to zero at any time with the push of a button. From there, as you move the handwheels, you can read the table position to 3-1/2 decimal places (.0005″) on the digital readout (Metric versions read to .01mm). You no longer need to count handwheel revolutions or make difficult calculations when cranking in a negative number. Kit includes two 2″ handwheels with encoders for X- and Y-axes and a 2.5″ handwheel/encoder unit for the Z-axis. Also included: digital readout box with LCD display, RPM sensor, power supply, cables, stand and all necessary mounting hardware. No hole drilling required to mount. 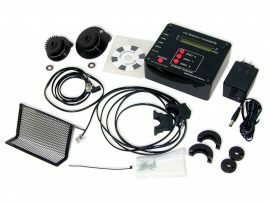 As long as we were designing the electronics package, we went the extra step to include an RPM readout, adding an additional function to the package. 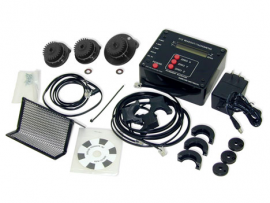 The sensors are easy to install and require no modification of your Sherline mill. A two-axis DRO package is also available for the lathe. 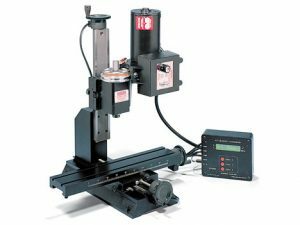 A three-axis package for using the lathe with the vertical milling column can be purchased, or a third axis can be added later if you add the vertical milling column to your lathe. For those with both a lathe and a mill, the electronic readout box can be shared between both machines to offer cost savings if you buy just the additional handwheels and cables for the second machine. USE WITH CNC: Though not designed to provide feedback to Sherline CNC machines as a closed-loop system, it can be adapted for use on the rear shaft of Sherline stepper motors for use as a separate readout. See DRO on CNC page for instructions.